Facial recognition gets better all the time. Here are some approaches that are being used to recognize faces under poor lighting conditions. Facial recognition technology is not new, but you feel that it’s a technology that has come of age in the past year or so. For instance, a number of health technology companies are using facial recognition to do things such as diagnose disease and detect medical adherence. You also have trials underway to try and automate the security process at airports by using facial recognition to perform tests in real-time from the moment we enter the airport. A similar approach is being used in technology fitted to police cars in China, with officers capable of running checks on citizens without having to stop them. Indeed, a British-based start-up is using this inside the store to use machine learning to detect whether a shopper might be about to steal something. Of course, for these technologies to work, they need to accurately recognize the faces, even under a variety of lighting conditions. Traditionally this has been a real challenge, with the best performances achieved in normal lighting conditions. A team from Toyohashi University of Technology have recently published a paper in which they describe their novel approach to the task. Their algorithm is capable of adjusting the effect lighting has on a human face by utilizing an extended reflectance model. The algorithm comes complete with a Fuzzy Inference System, which utilizes genetic algorithms to cope with the huge range of possible lighting conditions that it might encounter. “To eliminate the effects of light, image contrast should be adjusted adaptively. To produce an invariant face appearance under backlighting, for example, cheeks need to be brightened, while the eyeballs must be kept dark. Such an adaptive contrast adjustment can be performed using the developed reflectance model, and we show that a combination of Fuzzy Inference System (FIS) and Genetic Algorithm (GA) is very effective for implementing the model,” the authors say. “By just adding this contrast adjustment to present face recognition systems, we can largely improve the accuracy and performance of face detection and recognition. Moreover, this adjustment runs in real-time, and therefore, it is appropriate for real-time applications such as robot and human-interaction systems,” they continue. 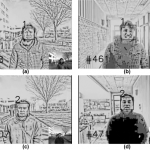 The number of possible use cases for advanced facial recognition technology is growing all the time, and while the majority of them thus far will take place in well-lit environments, this study highlights the possibility to expand the playground significantly. Can You Recognize 1 Million Faces? Can a Computer Algorithm? Facial Verification: Robust or Hackable?